Sparks are generated at the point of the perforation of the film by means of a high-voltage electrode (counting electrode) and a suitable earthed/grounded counter-electrode. These sparks are interpreted and counted by the logic circuit integrated in the PZ 3 perforation counter and indicated visually on the display through a light-emitting diode. The counting pulses transmitted by an opto-coupler can be interpreted by an external counter and may be used for activating other machine functions (such as the control of reversing winding machines and cutting machines). 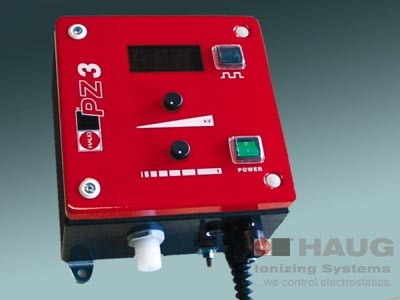 The PZ 3 perforation counter offers the possibility to capture up to 900 counting pulses per minute. This corresponds to a counting rate of 15 counting pulses per second (15 Hz). The duration of the counting impulses is adjustable from 5 to 1000 ms. This helps to suppress subsequent spark-overs that may be triggered by "holes" in the film and should not be counted. The high voltage applied to the counting electrode is infinitely adjustable from 2.4 up to 18 kVDC. The external release of the output voltage can be activated through a voltage-free contact, so that high voltage is applied to the counting electrode, for instance when the material web is moving. The counting electrode must be mounted above the material web at a distance of approx. 10 to 20 mm and centered over the perforations to ensure the perfect functioning of the PZ 3. An earthed/grounded counter-electrode below the material web (e.g. earthed metal drum) must be in physical contact with the foil opposite the counting electrode.